In March, Judge Lorna G. Schofield of United States District Court sounded an apparent death knell on the project with a decision that said the Hudson River Park Trust and the Army Corps of Engineers had failed to adequately assess how the pier’s construction would impact the river’s estuarine sanctuary. Yesterday the Hudson River Park Trust and the Army Corps of Engineers, which oversees construction on the river, filed an appeal of the judge’s decision. The Trust also filed a modified permit application in late April that addresses some concerns raised in Judge Schofield’s decision. 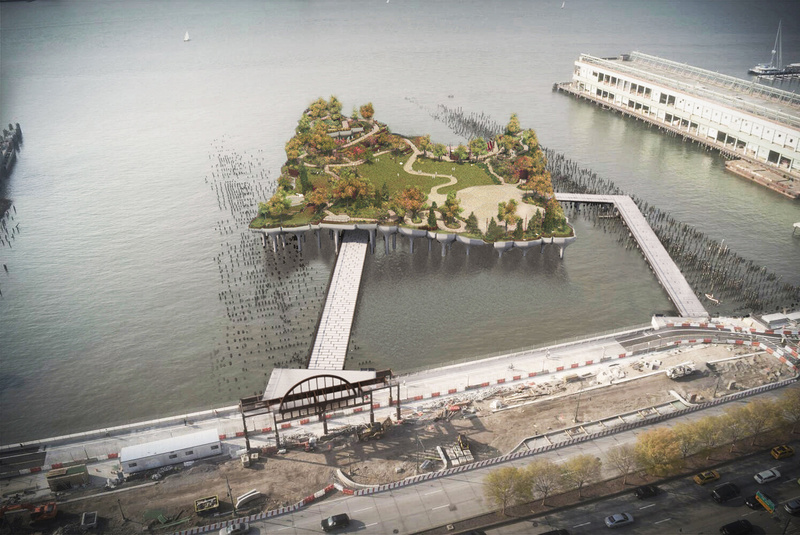 The new application nixes the barge that would be stationed alongside the pier and proposes a non-concrete fill for the mushroom-cloud “pots,” the piles supporting the lawn, stage, and other planned programs on the $250 million pier. The project is designed by London’s Heatherwick Studio, the same firm behind the recently axed Garden Bridge over the Thames. Financier Barry Diller and his wife, fashion designer Diane von Furstenberg, are fronting most of the money for the ever-more-costly pier. On Monday, Diller told the Times that, though he’s still with the project, he’s “ambivalent” about it because approvals are being stymied by opponents like the City Club. That fight is playing out in local media, including the pages of this paper. Diller has said that the City Club’s battle was financed by real estate mogul Douglas Durst—an accusation Durst himself confirmed in an interview with The Villager last week.